Peter Hickman in action on the Smiths Racing BMW at the North West 200 in 2018. Hickman will commence his international campaign at the fonaCAB North West 200 in association with Nicholl Oils from May 14-18, which will be the 90th anniversary meeting of the famous event. Smiths BMW rider Peter Hickman celebrates his victory in the Superstock class at the North West 200 last year. The Burton-on-Trent man, who became the world’s fastest road racer after clocking the first ever 135mph lap as he won the Senior TT on the Isle of Man last year, hopes to test the 2019 version of the S1000RR this week. Hickman is in the same boat as Tyco BMW rider Michael Dunlop, who also missed the British Superbike tests due to a delay in receiving the new machine. 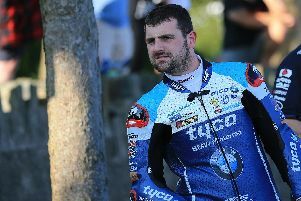 Dunlop finally tested his bike on Wednesday at Bishopscourt in Co. Down. Hickman said: “We only got our bikes 23 days ago which is very late and there are no parts available. Hickman also revealed that he will be limited to blueprinted stock engines at the North West rather than factory-prepped Superbike motors, which could put him at a significant disadvantage against the likes of Alastair Seeley’s PBM Ducati V4-R. However, he has dismissed any notion that he will be fighting a losing battle. “I think the men to watch will be the same people I have been up against every year at the North West,” he said. “Alastair Seeley, Glenn Irwin, Michael Dunlop and Dean Harrison will all be strong. Alastair has won a lot of North Wests and he will probably be the strongest as he is on the Ducati V4. He has got to start as favourite. “I am definitely not saying we are fighting a losing battle. 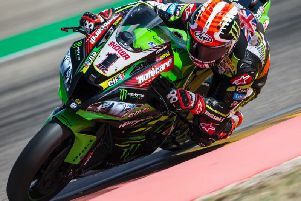 The North West is like a BSB race on the road and you can go from first to fifth or fifth to first in an instant,” added the 32-year-old. Hickman claimed his first NW200 success in 2018 in the opening Superstock race. He will also ride the Trooper Beer Triumph in the Supersport class at the North West next month. ‘It was really cool to get my first North West win," he said. "I have been close a few times in Supersport and 'stocker races but it hadn’t happened and then it all came together last year. 'I'll have done the opening two BSB rounds before I come to the North West so I should be up to speed and ready to go hopefully," added the BSB contender. "I haven’t ridden my BMW 'stocker or the 675cc Triumph since last year’s Ulster Grand Prix and although I have ridden the Superbike, it wasn’t on the roads. "Last year the bikes were the same as the year before, making it easier, but this time around the BMW have a new model and that will probably make things harder."